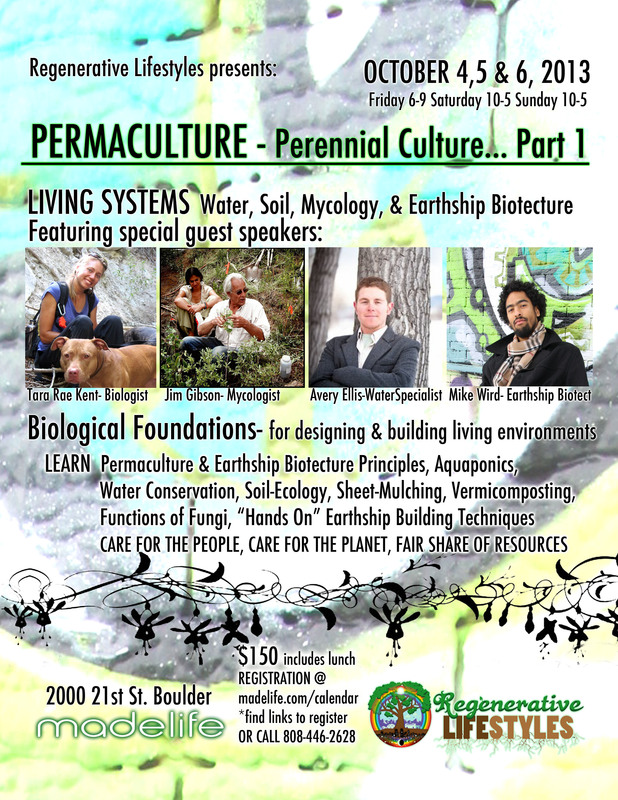 Here’s the schedule for the 2013 Colorado Permaculture Convergence at the Central Rocky Mountain Permaculture Institute (CRMPI) in Basalt and Sustainable Settings. Register here! • 10:00 am – Welcome and Introduction Circle!! Lunch will be provided on Saturday and Sunday. Please bring snacks to share. With infinite possibilities, one could wonder why we are in the predicament of Ecological disaster. The planet holds the solutions, and with inspiring and useful experience; with interesting educational opportunities, we can all learn to work together and be the catalyst for change. Soil– As Colorado residents, we live in a desert, a place where we can design and create environments which can heal depleted soils, aid in water retention, and balance soil structure. Tara Rae Kent will be speaking on soil building; utilizing vermicomposting, and sheet mulching. When designed with the natural patterns in mind, plants grows bigger, better and healthier, thus creating abundance. Water – Water flows, usually straight to the gutter or into the foundation of the building. The information about greywater and aquaponics that Avery Ellis will present can help participants learn how to conserve water, practice re-use, grow happy plants, and lower water bills. The design systems provide tools that can help you, your family and the community. Mycology– The study of Fungi, a strange and creative world that lives almost everywhere. Fungi are evolutionarily more closely related to animals than to plants, and their uses are both complex and surprising. Jim Gibson will define Mycology and his work, possibly inspiring an interest into a way of life. Earthship Biotecture– Some people think that there’s a village of Aliens living just outside Taos, New Mexico, in super strange and beautiful Earthships. But if you look into it, you’ll be excited to find, they’re radically sustainable, off-grid structures that follow 6 design principles. Mike Wird will be lecturing about his experience of Earthship Culture, the principles of Biotecture. On Sunday, we will work together to start an Earthship Chicken Coop @ In the Grove-Urban Permaculture Design Site, located in downtown Boulder on 1/3 acre. There, participants will experience tire pounding, building can walls, and constructing bottle bricks. Avery has a Masters degree in Ecological Design through SFIA, a BS in Biology & Sustainability, and Advanced Permaculture Designer and PC Teacher certificates, and is a certified greywater installer. Avery is a leader in the movement to make greywater and water catchment an attainable resource, and is currently writing Colorado water code. Design, & Installation for Water Reuse & Ecological Sanitation. Tara Rae Kent holds an Advanced Permaculture Design Certificate, and a Permaculture Teaching Certificate. She has managed several greenhouses, USDA-organic, organic, and permaculture farms with experience in 3 climate zones – cool and wet; cool and dry; and warm and wet. In the last decade, Ms. Kent has worked in scientific laboratories for universities, taught water quality monitoring classes, and authored a nature center field guidebook. She holds Bachelor’s and Master’s degrees in biology and freshwater ecology, and works as an environmental scientist/biologist in the consulting world. Hiphop arts renaissance man, the artist’s artist. 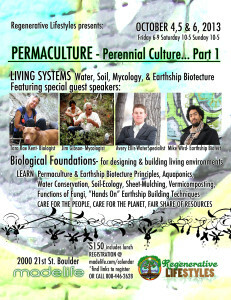 Mike is certified in Advanced Permaculture Design and Earthship Biotecture. He teaches Permaculture Design, Biotecture, and Hiphop. As an educator, organizer, entrepreneur, DJ, emcee/poet, natural holistic health and wellness advocate and sustainable living practitioner, he brings important issues to light. Currently, he’s teaching high school in Denver with YouthOnRecord. (O.G.) organic gardener and natural builder, Mike is Co-founder of Denver Earthship, dedicated to bringing Earthship Biotecture to the city. Calling all Boulderites with a bit of time on their hands! Join Donate Boulder – Community Organized Flood Relief to get muddy and lend a helping hand to our neighbors in need! The Mudslingers are operating out of 1911 11th Street #207, Boulder. The HQ phone number is 720-310-5170. Meet at 8:30 am for assignment. Later in the day, you can go to www.donateboulder.org and look for the red tabs that say “Volunteers Needed Now.” That’s where help is needed, in real time! As I watch this downtown Boulder neighborhood dry slowly, and listen to the sounds of rescue helicopters overhead, there have been a few thoughts at the front of my mind: design for disaster! People Care! Earth Care, People Care, Fair Share (to achieve the aims of Earth and People Care): the ethics of permaculture. Boulder was hit with the Four Mile Canyon Fire in September, 2010. In September, 2013, over the course of a few days, the heavy rainfall and flooding in the burn areas formed devastating landslides that took lives and destroyed homes and roadways. Last week, many farms in Boulder County were under water. The excess of the 10 to 15 inches of rain that fell in the Boulder foothills, and 15 to 20 inches of rain that fell in downtown Boulder between Monday, September 9th, and Sunday, September 15th, 2013, is making its way eastward in the form of flood waters. As flood waters continue to spread from the Front Range, thousands more people, structures, roads and farms are affected. In some areas, raw sewage is flowing into waterways. We must design for disaster. In the spirit of People Care, comments, reflections, and/or requests for help from the permaculture community are welcome. Regenerative Lifestyles and madelife present a free screening of WASTE LAND on Monday, September 23rd at 7pm. 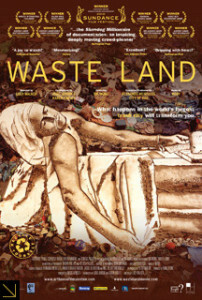 The film is an inspiring story of a Brooklyn artist who travels to the word’s largest dump outside of Rio de Janeiro to profile the “catadores”, or pickers of recyclable materials. This film was Winner of the Audience Award for World Cinema Documentary at Sundance Film Festival in 2010. Doors at 6pm, a discussion of Water & Design for Living Environments at 6:30pm, and film starts at 7pm. madelife is located at 2000 21st St., Boulder, CO 80302. Voluntary donations will be collected for those in need.